I have lived in Alaska 7 year this go around. Before moving to Eagle River in 2003, I lived in the Seattle area (North Seattle and Edmonds) for almost 20 years. Before that 3 years in Valdez, and 6 years in Fairbanks. My first 9 years in Alaska, when Christmas came around, my family was all into the go out for Christmas events stuff. Going to local churches (mainly the ones my dad was the pastor at), schools, peoples houses for various musical performances, tree lightings, Santa, and parties. I remember some years it seemed like every night during the holidays something was going on. I especially remember the Messiah performances in Valdez. 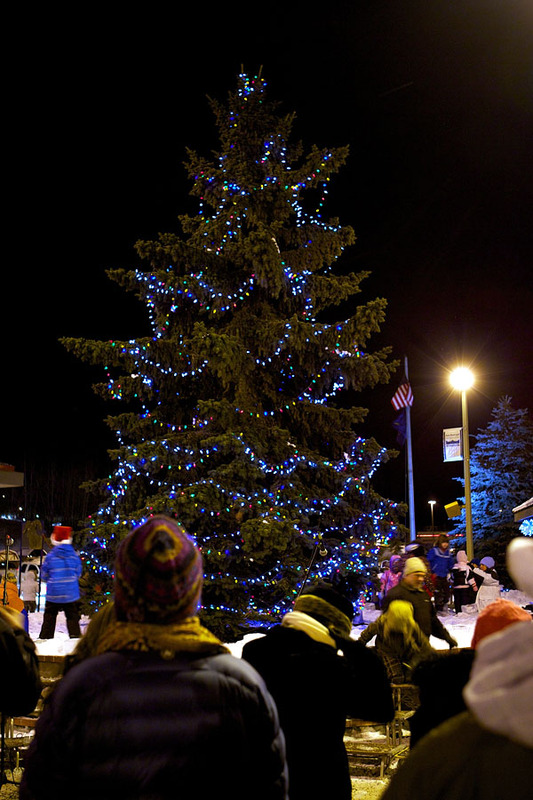 After moving back to Alaska and living here in Eagle River for 7 years, I have been to two or three Messiah performances in Anchorage (the last directed by my sister, the previous ones she sang in), I have been to the Anchorage tree lighting once, been to Girdwood during the holidays for their festivals at least once, but I never went to a Eagle River Christmas event. I knew about the Merry Merchant Munch… well, I knew it took place, but I did not really know what it was. So, on Friday night I decided to grab my cameras and head into downtown Eagle River to see what the Merry Merchant Munch was. I know what I saw was just a little part of it, but it surprised me. I had no idea it would be so fun and so disturbing at the same time. The fun part was everyone was in the holiday mood. Kids from the local elementary schools were singing carols, people were really in the Christmas spirit, local businesses had stands set up with hot cocoa, hot apple cider, coffee, all waiting in anticipation of Santa Claus and his reindeer showing up and the lighting of the town center Christmas Tree. And then the disturbing part. Santa showed up. It was pretty amazing at first. 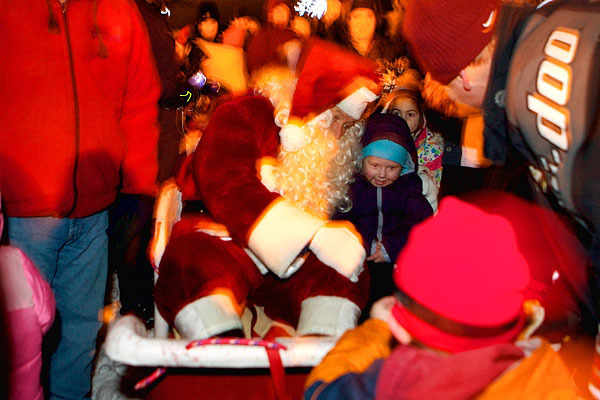 People swarmed over to one side of the park when local representatives of the Eagle River Rotary Club and their families carried torches as they escorted Santa and his reindeer into what was going to instantly turn into total chaos. 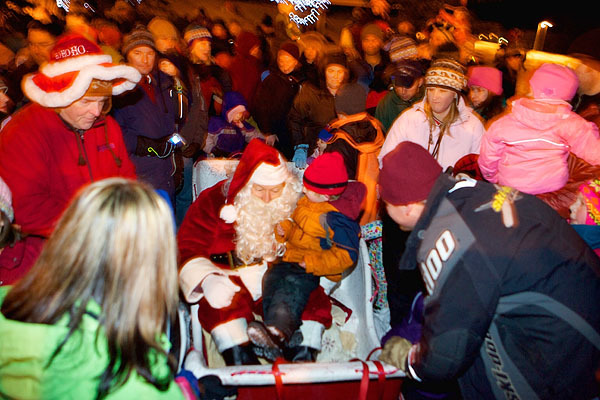 People started crowding around Santa’s sled, before it stopped moving. I saw kids being dragged by their parents and thrown onto Santa’s lap, people pushing in to get a photo of Santa, whether their kid was on his lap or not. The photo above of Santa, and the next two I used a slow shutter speed and dragged the flash to give a feeling of the constant movement going on around Santa and his reindeer. Some of the kids were smiling at Santa, some were screaming, I actually felt claustrophobic as I waded in to the crowd to grab a couple shots. I decided that as long as Santa is mobbed, I will get some nice shots of his sleigh pullers. They should not be as mobbed as St. Nick. This is where I was heartbroken. Not for myself, but for the poor reindeer. Now let me first say, I am a strong believer in PETA (People Eat Tasty Animals, right), I am all for hunting for food, and I do not like teasing animals, domestic or wild. 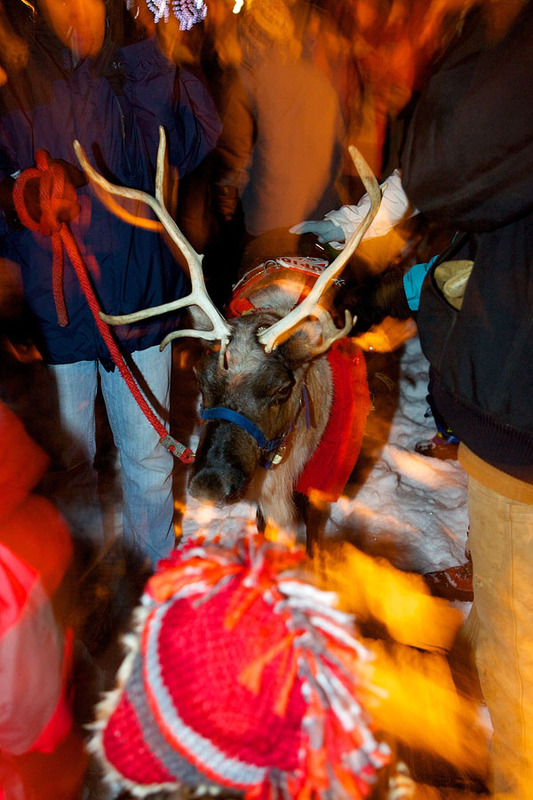 But I saw kids all but hanging on antlers, mobs of hands reaching out to pet the reindeer, a couple kids almost being speared by an antler or two, parents shoving kids in front of a body part of one of the animals to get a snapshot. It was out of control. Trying to get a clean shot without someone just standing in front of me was nearly impossible. But once I got a couple shots, I decided to call it a night. Hot apple cider was not keeping me warm anymore. I was not in a real Christmassy mood any more, and my toes were cold. So I left. Will I go back? You bet. I had a lot of fun before Santa arrived. It is a lul for me between high school football and basketball, and I saw a lot of parents and kids that I know from shooting high school sports, so it gave me a chance to chat with them, there really was a holiday feeling in the air, and if there is a chance of me getting a shot of a reindeer revolt, I will be there. This entry was posted on Thursday, December 9th, 2010 at 8:23 pm	and is filed under Media. You can follow any responses to this entry through the RSS 2.0 feed.